I have lots of stitching plans for the year ahead – much less travelling and teaching generally but with classes at my local quilt shop The Corner Patch in Eccleshall, also at The Bramble Patch. A Corner Patch retreat in June, followed by a Grand South Western Tour in Devon and Cornwall. For much of the year though I will be at our home in southern Spain and in May I will be hosting a small hand stitchers retreat there. 13th – 18th May with four days of hand stitching, kitted retreat projects, a visit to a renowned embroidery museum, good weather, good food, all in a private and comfortable domestic setting. Just six places are available …… and bookings close on 21st March. 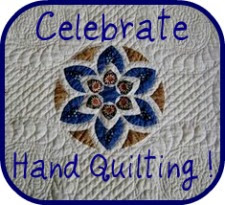 This entry was posted in Quilting, Teaching. Bookmark the permalink. ourhomesinspain@gmail.com we’ll send all the info to you – places still available as at today 11th March. Quilter, teacher, designer, writer. Currently dividing my time between deepest middle England and southern Spain – life is tough sometimes!